Over the last year and a half, we have been living and traveling in our Bayhill 385 BHS. This camper is 41 feet long, is a bunkhouse model, and has five slides. It has worked well for us, but has some limitations that don’t fit us as well as we would like. Some of these are: smaller gray and black tanks, no generator, not very many windows, and no way to vent the camper without shore power. We had realized these through our normal use, but they really became bothersome during a move from California to Ohio when we boondocked by staying at truck stops and rest areas at night. At the time, however, it wasn’t nearly enough to warrant actively looking for another option. The floorplan and other features were still really working for us. 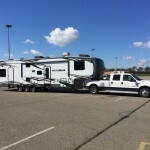 While traveling for work in Ohio, I stopped at RCD Sales in Pataskala just to look at new models (We are always looking) and they had a Jayco Seismic 3712 that had been built for another dealer but had not been taken, making it a bit of an orphan. 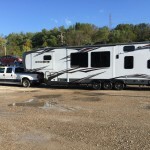 Jayco had asked this dealer to take it after the other dealer had backed out, and it was now theirs. We had looked at but not seriously considered Toy Haulers before, because although they seemed to be built with heavier use in mind (making it ideal for full-timing), they were not as comfortable inside. This unit, however, was built heavier (literally and figuratively) and had amenities inside that would allow a family of six to live comfortably. The 3712 is 42 feet long and 13 feet 6 inches tall. That is a lot of camper! It has three axles, which I like because it gives me an extra set of brakes. It has a generator, making daily and nightly stops easier and more comfortable. It has bigger fresh water, gray, and black tanks so we do not have to be worried about camping in a campground every day. Inside, although it only has two slides compared to our Bayhill’s 5 slides, the floor space is about the same because the back beds tuck up against the ceiling, leaving that area open for use (and two slides is less maintenance and less worry). It has vent fans in the front bathroom, main living area, and the back room, making it easier for us to vent the camper when not hooked up to power (we don’t always want to run the generator). The layout is also very family friendly, with a front bedroom, middle living area, and back toy area/bedroom/school and play area, as well as a separate queen size loft area between the main living area and the back garage. This allows for three separate sleeping areas, making it possible to separate the boys and girls for sleeping. It also has two bathrooms, which, while not being a strict necessity, markedly decreases frustration when dealing with teenagers. At the dealer, our whole family spent a full day going through the unit, looking at its space, looking at its features and ability to hold all of us for full-timing. We also used this as a “grand parents day”, having both sets of our parents visit with the kids to further test livability. After much consideration and dealing, we decided to trade our 1 year old Bayhill for the Jayco Seismic. Once that decision was made, we worked with the dealer to have several things installed to help with making it more user friendly to us. It already had three vent fans, but we had Black Maxx-Air covers put over all the roof vent covers to block out street lights and allow for vent use in all weather conditions. We also had a stove/oven added, as we prefer to cook with a regular oven and this camper came with the stove and convection oven option. This does give us the benefit of having two ovens, however, which will be handy down the road. On a very cold and windy day, we took delivery. Because we are full-timers, this involves lining the campers up and moving everything between the two. Quite an accomplishment for one day’s work, and it still leaves quite the mess as we figure out how to use the storage in this camper most efficiently. We are now in our new home, and are getting ready to head west once again in a couple of months.